Everybody who watches basketball knows what this face means. 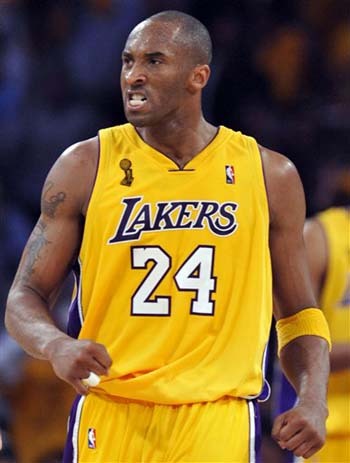 For those who don’t, it means that it’s time for Kobe Bryant to do work. The game face was on display today, and needless to say, Kobe did work. The Lakers won their third consecutive game this afternoon after edging the Mavericks 103-99. Despite Dirk Nowitzki playing his best game of the season, scoring 30 points and adding 13 rebounds on 58 percent shooting, Kobe played better. In 38 minutes, Bryant dropped 38 points, 12 rebounds and seven assists on 62 percent shooting. After scoring 40 points on Friday while shooting 60+ percent, Bryant became the oldest player in NBA history to put up these numbers on back-to-back nights. With the Lakers and Mavericks both scrapping for the final playoff spot in the Western Conference, both teams fought as if this was a playoff game. There were 39 total fouls, three technical fouls, and 21 lead changes during the game. With these circumstances, and Dwight Howard staying in foul trouble throughout the entire game, Bryant needed to have a huge game. Besides Bryant’s phenomenal game, there were not many other story lines to this game. But there were a few positives for the Lakers. Steve Nash had his highest-scoring game of the season. Not only did Steve Nash shoot 7-of-12 from the field, but he was also able to shoot four out of five from beyond the arc, including clutch threes when the game was tight. The three point shooting was key for the Lakers. The Mavericks forced more turnovers, shot pretty much the same percentage from the field and had almost the same amount of rebounds and assists, but Los Angeles had the advantage in three-point shooting. Dallas was able to make eight threes on 44 percent shooting, but the Lakers were able to make 13 three-pointers on 52 percent shooting. Whenever the Lakers needed a big shot, either Bryant, Nash, Antawn Jamison or Jodie Meeks was able to hit a big three for the Lake Show. This proved to be more than important down the stretch. Although it is great to see the Lakers creep to within one game of .500, they will be tested tomorrow night when they take on the Denver Nuggets at the Pepsi Center. Let’s just hope that Kobe has some gas left in the tank, but at this point, should we even worry?